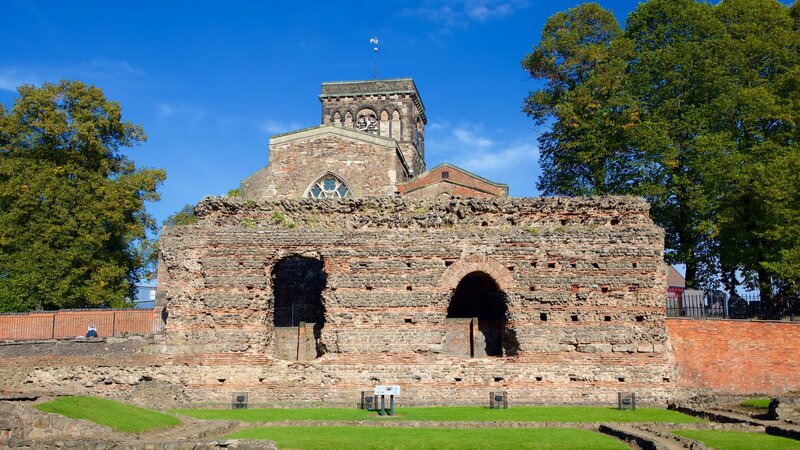 The Roman name for Leicester was Ratae, taken from a Celtic word for the ramparts that may have defended the pre-Roman settlement. The baths were situated at the heart of Ratae, just west of the Forum and Basilica. On this site 2000 years ago stood a complex of buildings which functioned rather like a modern health club. There was a gymnasium, or palaestra, and a cold bath house from which visitors then progressed into the warm and hot rooms. Public bathing was a popular social custom throughout the entire Roman world and baths like these would have been a space for meeting friends, swapping gossip and doing business. 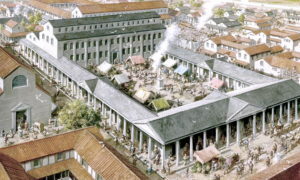 Roman towns and cities of any size at all would possess public baths. In AD 122 the Emperor Hadrian visited Britain bringing a new governor and a new legion to start construction of the world famous wall, which still bears his name. There is no record of the Emperor actually visiting Ratae on his travels, but it is known that he toured provinces throughout the Empire at a rapid pace and was keen on the development of towns and cities as a means of promoting peace and security. Work started on construction of this complex about AD 125 and took approximately thirty years to complete. This would have been a major building project and it’s likely that funding for the construction came from the local government. The baths would have needed an aqueduct to supply its water and a large tank or cistern to store it. The baths complex was in use for over two hundred years. Then about AD 360 there was a severe fire in Ratae, after which the site does not appear to have been repaired. This means that the baths would have been out of use for fifty years even before the Romans left Britain; the memory of what was here may soon have faded. Historians now think that the name ‘Jewry Wall’ probably comes from a corruption of Jurats, the Latin word for the jurors of the Saxon Borough that met in the adjoining church yard. There is no evidence that the Jewry Wall is associated with Jewish residents of Leicester. Today, we can see only the core of the wall; originally it would have been heavily plastered on both sides and we can now see the construction method in detail. From the foundations to the roof eaves it alternates between several courses of stone and layers of brick. The stone used in the building of the wall would have come from nearby quarries in places like Groby and Mountsorrel, Leicestershire. This typical Roman method of building gave the wall great strength to support a vaulted stone roof and also assisted the masons in checking that each level was going up straight and true. One of the arches visible had the top and bottom knocked out in medieval times and a small house built there – the surviving double brick arch that we can see is typical of Roman building in this period. The rows of holes in the Jewry Wall are called ‘putlog’ holes – putlogs were short pieces of timber used to support wooden scaffolding during construction. Over the centuries the timbers rotted and as the plaster came away the holes were revealed. The baths were opened every day of the year from about midday until late afternoon and admission was normally on payment of a small copper coin. 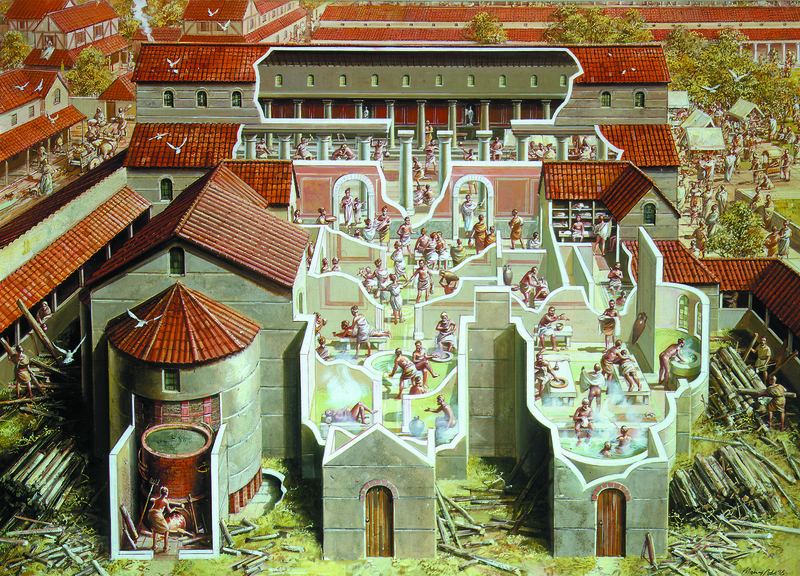 Visitors would probably exercise first in the palaestra and then wash in the cold bathhouse. The level of heat then slowly increased as visitors moved to the tepidarium and the caldarium. Bath attendants would rub oils into the skin and sweat would bring the dirt to the surface.